After an initial batch of 12 new birds for the year by watching my feeders at home, my next batch all came through the windshield of a car. On my first trip into the store this year, I knew I'd pick up a few more easy year birds. I expected to see these suburban birds that usually don't visit my feeders. Sure enough, along Jones Road I saw American Crows, and from the Chipotle parking lot, a few House Sparrows perched in a small tree while across the road on Route 50, over 100 European Starlings were perched on the power lines, like quarter notes playing out a long, monotonous tune. A couple days later, I headed down the interstate on a trip to the Philly area. I saw Rock Pigeons clustered around exit 12. All along my drive, Red-tailed Hawks perched high on trees and poles looking for their next meal in the snow below. In New Jersey, I started seeing Turkey Vultures with their teeter-totter flight. Turkey Vultures leave upstate New York in the winter, though now I know they don't go far. In New Jersey along interstate 78, I saw a smaller vulture with a white only on the tips of their wings - now I'm glad I learned to identify Black Vultures during my trip last year to Texas! In Pennsylvania, Herring Gulls frequented the parking lots of the King of Prussia mall area. Fittingly, near the Audubon exit on Route 422, many skeins of Canada Geese - and many other unidentifiable waterfowl - flew overhead. Unbeknownst to me, I was within minutes of the John James Audubon Center at Mill Grove. I'll definitely make time for a stop there next time I'm in the area! So my year list stands at 21 right now. I'll be in downtown Atlanta soon and while there, I'll be on the lookout for birds that can be seen in an urban environment to add to my year list. We recently surveyed our customers asking for their favorite birds and the votes are in! The Northern Cardinal is their #1 favorite bird! The full list of all 60 birds is available to add to your Thayer Birding Software. Follow this link to the list and this link to instructions to download it to your software. Thayer Birding Software lets build custom lists of your own and to share those lists with other users. 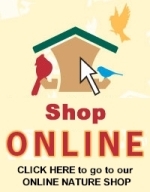 Thayer Birding Software is available at Wild Birds Unlimited - Saratoga Springs NY, at many other WBU shops, and online. Migration wraps up this month so this will be my last report on the birds returning to my yard this spring. I've used the arrival of each bird to learn something new or fun about them from Pete Dunne's Essential Field Guide Companion. Sapsuckers returned on May 15th, later than previous years. As the Mountain Ash trees in my yard decrease (I lost another this winter; read about it in my Lamenting the Loss of a Tree post), I wonder how long sapsuckers will continue to stop in my yard. The two sapsuckers I saw went straight to work on the lone surviving ash tree, drilling a few new sap wells. It was then very fascinating to watch a chickadee check out the wells after they were drilled, I imagine searching for the insects that the sap attracts. "A shy bird, Yellow-bellied often moves to the far side of a limb to avoid study...observers are often unaware of the bird's presence. Dislodged shards of bark are few, and the bird's tapping is surprisingly soft, almost soundless. Often birders are alerted to the bird's presence by its call." All so true, just as I've experienced the Yellow-bellied Sapsucker! Appearing later this year than all other migratory birds to my yard, Tree Swallows usually show up in mid-April but they didn't show up until May 16th! I don't really have a good habitat for them to breed, but they regularly pay me a spring visit and are often seen catching insects on the wing. I oftentimes witness courtship behaviors and copulation as well before they move on to more open areas. This year was no exception. "Sometimes carries (usually white) feathers aloft and, releasing them, pursues them in the air." I had been wondering about the total absence of Evening Grosbeaks in my yard this spring. Birdwatchers in British Columbia, Canada and in the western U.S. seemed to be hogging all of them! But then on June 2, I was lucky enough to have a pair pass through the yard. In years past, they came through in April! Unfortunately, they moved on after staying only a few minutes. "In breeding plumage, the huge lime green bill is too anomalous and imposing to ignore...The yellow eyebrows make the birds look fierce or cross." Of the nine oriole species found in North America, the Baltimore Oriole is the most widespread in the east and the Bullock's is common in the west. Orioles of all kinds can be drawn into our yards by offering food such as orange halves or slices, grape jelly, or mealworms. Orioles might even use the protein-rich mealworms to feed to their nestlings! When serving grape jelly, it's important to put out smaller quantities and in shallow dishes. This will help minimize the danger of other small birds inadvertently getting trapped in the thick jelly. Orioles will also visit nectar feeders, which supplements the natural nectar they find in flowers. You'll need a special nectar feeder for orioles; their beak is too big to access nectar in hummingbird feeders. The nectar solution for orioles is also weaker than hummingbird nectar - a 1 part sugar to 8 parts water solution (vs. 1-to-4 ratio for hummingbirds). Orioles seem more easily attracted to feeders if their preferred foods are waiting for them upon their return from their tropical winter homes. That's why it's a good idea to maintain a journal of the bird activity in your yard from year to year. Orioles return to my area within the first 2 weeks of May each year. It's when the black cherry trees are in bloom - another easy way to remember! Place feeders in the open so they're very visible. Remember these are treetop birds so try to think about their perspective when you choose a spot for your feeders. 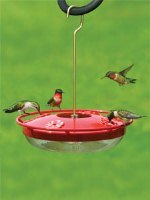 It's also best to keep oriole feeders separate from other bird feeding stations. Remember to keep the foods you offer orioles fresh, replacing the food every few days. Clean the feeder regularly. And BE PATIENT - it may be several seasons before orioles find and utilize a feeder. But it will be worth it, so give it a try and in the meantime, enjoy this gorgeous bird and his wonderful song! Orioles are also amongst the birds that are known to winter in shade-grown coffee farms. Help protect the birds you love by drinking only certified shade-grown "Bird-Friendly®" coffee like Birds & Beans™ brand. Available at WBU-Saratoga Springs NY and online. The Fort Edward (NY) Grasslands Important Bird Area (IBA) is a 13,000 acre agricultural grassland complex located in the towns of Ft. Edward, Argyle, and Kingsbury. The IBA contains working farms, grassland areas, cultivated fields, small woodlots, and wetlands. The site is the largest intact grassland habitat in eastern New York and is vital for grassland birds, many of whose populations across North America have plummeted in recent years due to habitat loss. High quality grassland acreage in New York State has been rapidly decreasing due to fragmentation and urban sprawl. - The IBA hosts many summer breeding bird species, including Northern Harrier, Upland Sandpiper, Grasshopper Sparrow, Henslow's Sparrow, Vesper Sparrow, Savannah Sparrow, Bobolink, and Eastern Meadowlark. - The IBA is also an important raptor wintering area. Species commonly found include Northern Harrier, Short-eared Owl, and Rough-legged Hawk. Non-raptor species that depend on the grasslands include Snow Bunting, Horned Lark, and Lapland Longspur. - Other interesting sightings in the IBA have included: Merlin, Snowy Owl, Brown Thrasher, Northern Shrike, Blue-winged Warbler, Dickcissel, and Orchard Oriole. Nearly all acreage in the IBA is privately owned. Pressure from residential development has put this special place at risk for not only the grassland birds, but for residents who value their rural lifestyle. You can help by getting involved with Southern Adirondack Audubon Society's efforts to save the Fort Edward Grasslands Important Bird Area. Please visit their website for the latest information. Birding in the Ft. Edward IBA? Please consider entering your data at www.ebird.org. This online database will help keep track of the locations and numbers of birds using the IBA. This information is reprinted from The Fledgling, the newsletter of the Southern Adirondack Audubon Society (links added). Please support SAAS by becoming a member. Read more about The State of Grassland Birds from the 2009 The State of the Birds Report.